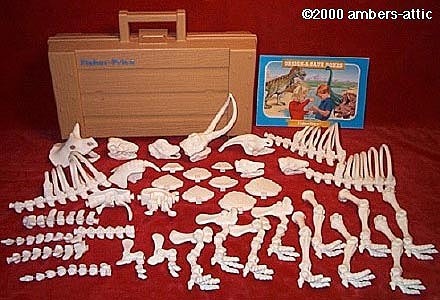 Description: This is a set of plastic dinosaur bones that can be put together to build 7 different dinosaurs (any three at one time). 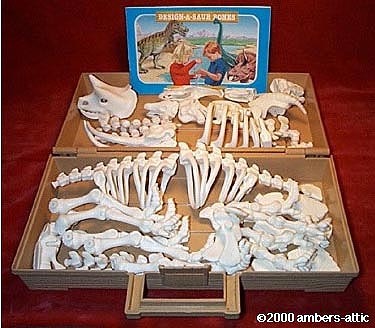 Children can also put the bones together to make their own wacky dinosaur. 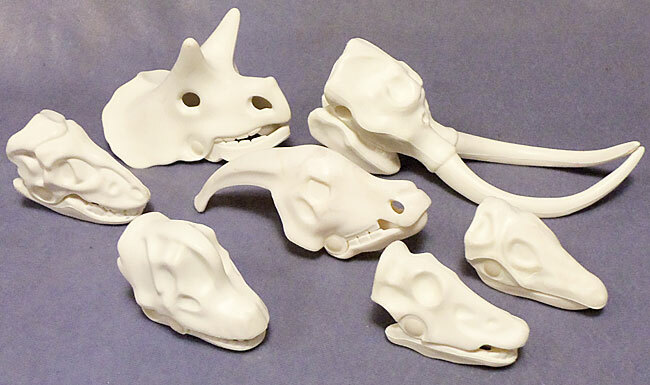 The set includes 40 bone sub-assemblies that can be arranged in countless ways. 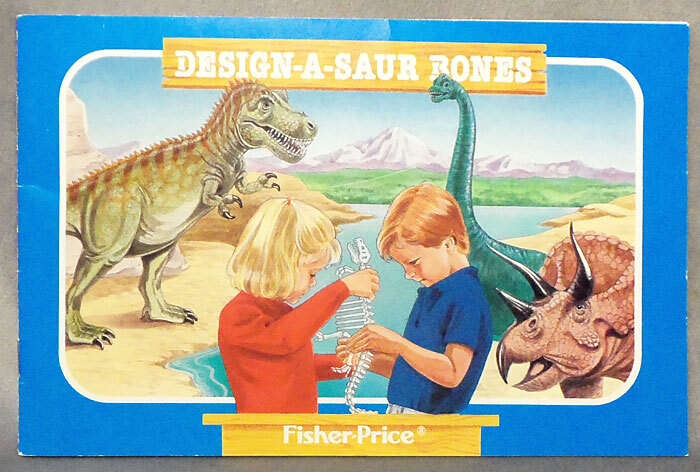 The set includes an information booklet with fun facts about dinosaurs and how to make them. The piece store in a crate-like carrying case with a built-in handle for portability. Designed for children ages 4 to 8 years old. FPT14734 - White dinosaur bone head with 2 long tusks on the end of the nose. The head has a hinged jawbone allowing the mouth to open and close. The mouth has squared elephant-type teeth. Measures 5-1/4" long from top of head to end of tusks, 2" high from top of head to bottom of jaw, and 1-3/4" wide from side of head to the other side. FPT14735 - White dinosaur bone head with a long bone on the top back of it's head. The bone attached to the back of it's head is very long and narrow. The head has a hinged jawbone allowing the mouth to open and close. The mouth has 12 long rectangular teeth, 6 on top, and 6 on the bottom. The head has an oblong hole on each side of the nose. Measures 4-1/4" from end of nose to end of head bone, 2" high from top of head to bottom of jaw, and 1-1/4" wide from side of head to the other side. FPT14736 - Large white dinosaur bone head with a 2 pointy horn bones on the top of it's head. The head has a hinged jawbone allowing the mouth to open and close. The head two eye holes and two nostril holes. Measures 3-1/2" long, 2-5/8" wide, 2-3/8" tall. FPT14737 - White dinosaur bone head with a rounded hump bone in the center of it's forehead. The bone has a deep groove on each side, and an eye indention below the deep groove. The head has a hinged jawbone allowing the mouth to open and close. The mouth has lots of small teeth (not pointy). The nose is just a rounded hump with no nostril holes nor indentions. Measures 2-1/8" from end of nose to back of head, 1-1/2" high from top of forehead bone to bottom of jaw, and 1" wide from side of head to the other side. FPT14738 - White dinosaur bone head with a long narrow raised bone on the top of it's nose and head. The head has large eye and ear indentions on each side. The head has a hinged jawbone allowing the mouth to open and close. The mouth has lots of sharp pointed teeth. The mouth and nose are very narrow on the tip, making the head shaped a bit like an arrowhead. Measures 2-1/8" from end of nose to end of jaw bone, 1-1/4" high from top of head to bottom of jaw, and 1" wide from side of head to the other side, becoming narrow at the tip of the nose. FPT14739 - White dinosaur bone head. The head is long and narrow with small eye and nose indented holes on each side of the head. Each side of the head has a large round indented hole behind the eye, with 2 other indented holes behind the large round one. The back of the head (behind the eyes) is larger than th front of the head (eyes, nose, and mouth). The head has a hinged jawbone allowing the mouth to open and close. The mouth has teeth on the front part of the mouth. The teeth look similar to horse teeth. Measures 2" from end of nose to back of head, 1-3/8" high from top of head to bottom of jaw, and 7/8" wide from side of head to the other side. FPT14740 - White dinosaur bone head with a long mouth, and a large eye indented hole on each side of the head. The head has a hinged jawbone allowing the mouth to open and close. The mouth does not have any teeth, and the mouth is just as long as the dinosaur head. Measures 2-1/8" from end of nose to back of head, 1-1/4" high from top of head to bottom of jaw, and 1-1/16" wide from side of head to the other side. FPT14741 - 3 each - Long white left dinosaur leg bone with a jointed knee, and a jointed foot. The foot has 3 long toes with slightly pointy toenails on the end. The leg has a round connector peg on the top right side of the bone. The chin bone (between the knee and ankle) is marked "MACAO" on the right side of the bone. Measures 5-7/8" long from top of leg to bottom of heel. 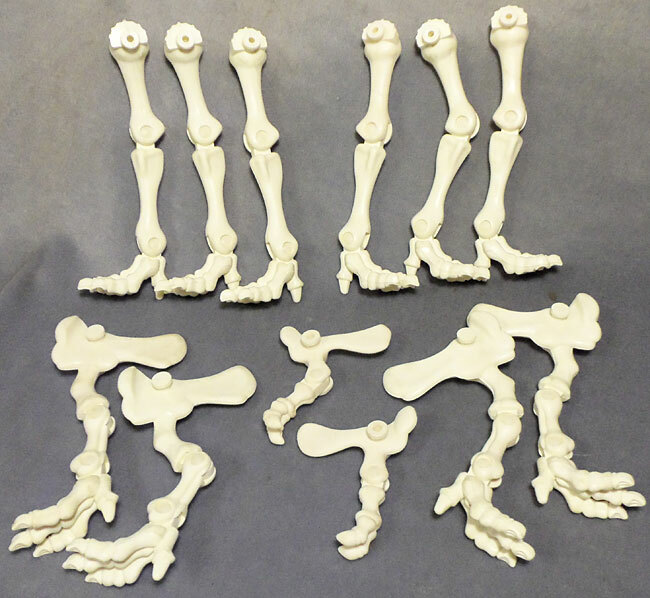 FPT14742 - 3 each - Long white right dinosaur leg bone with a jointed knee, and a jointed foot. The foot has 3 long toes with slightly pointy toenails on the end. The leg has a round connector peg on the top left side of the bone. The chin bone (between the knee and ankle) is marked "MACAO" on the right side of the bone. Measures 5-7/8" long from top of leg to bottom of heel. FPT14743 - 2 each - White left dinosaur leg bone with a jointed knee, a jointed foot, and a very large odd-shaped hip bone. The right side of the hipbone has a round connector peg. The short chin bone (between the knee and ankle) is marked "MACAO" on the left side of the bone. The foot has 3 long toes with slightly pointy toenails on the end. Measures 4-5/8" long from top of hipbone to bottom of heel, 2-5/8" wide from front of hipbone to back of hipbone. FPT14744 - 2 each - White right dinosaur leg bone with a jointed knee, a jointed foot, and a very large odd-shaped hip bone. The left side of the hipbone has a round connector peg. The short chin bone (between the knee and ankle) is marked "MACAO" on the left side of the bone. The foot has 3 long toes with slightly pointy toenails on the end. Measures 4-5/8" long from top of hipbone to bottom of heel, 2-5/8" wide from front of hipbone to back of hipbone. FPT14746 - Short white left dinosaur arm bone. The arm is jointed in the middle, and the end of the arm has 2 claw-link fingers with pointy nails on the end. The top of the arm has a large shoulder bone with a round connector peg on the right side. The right side of the shoulder bone is also marked "MACAO ©'89 F-P". Measures 2-1/2" long from top of bone to end of fingernail, 2-1/8" long from end of shoulder bone to other end of shoulder bone. FPT14747 - Short white right dinosaur arm bone. The arm is jointed in the middle, and the end of the arm has 2 claw-link fingers with pointy nails on the end. The top of the arm has a large shoulder bone with a round connector peg on the left side. The left side of the shoulder bone is also marked "MACAO ©'89 F-P". Measures 2-1/2" long from top of bone to end of fingernail, 2-1/8" long from end of shoulder bone to other end of shoulder bone. FPT14748 - White dinosaur hip bone with a round center "spine" bone that has sort of a flat shell shape on the top, and a long skinny bone attached to the bottom. There is a female receiver peg on each side of the bone, and a round male connector peg on back end of the round spine center bone. Measures 3-1/4" long from end of round spine bone to other end, 1-5/8" wide from side of top shell to other side, and 2-1/6" high from top of top shell to bottom of skinny bone under the spine. FPT14749 - White dinosaur hip bone with a curved center "spine" and a wide rounded bone on the top sides. The end of the spine bone is small and curved downward, like a tail bone. There is a female receiver peg on each side of the bone, and a round male connector peg on the front of the spine bone. Measures 3-1/2" long from front of round spine and side bones to the "tail" end of the spine, 1-7/8" wide from side of top shell to other side, and 2" high from top of top shell to bottom "tail" bone. FPT14750 - White dinosaur hip bone with 4 spikes on top of the "spine". The sides of the bones are curved with a female receiver on each side to attach legs. The bottom of the bone have 2 odd-shapes bones below the side female connectors. The front and back of the spine have a round male connector peg. Measures 2-3/4" long from end of spine bone to other end, 1" wide from side of spine to other side, and 2-3/4" high from top spine to bottom bones. 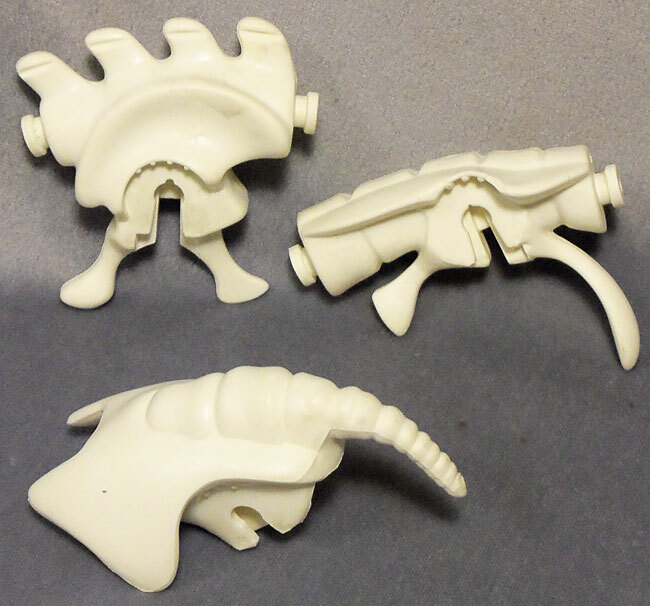 FPT14751 - 3 each - White dinosaur bone ribcage with a jointed spine. The ribcage has 6 oval-shaped bones connected together by a spine. The front of the ribcage/spine has a large oval-shaped bone with a female peg receiver on the top front to attach other dinosaur bones. The bones behind the front oval-shaped bones get smaller and smaller. The last of the 6 bones has a female peg receiver on each side to attach leg bones. 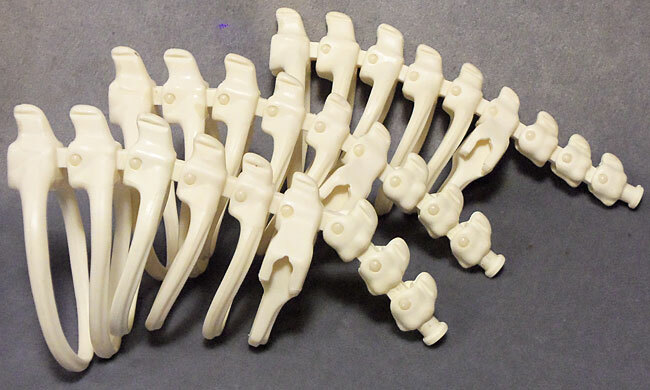 The back of the ribcage has 3 small spine joint bones with a round connector peg on the end. Measures 6-1/4" long (front of spine and rib bones to end of spine), 3-1/2" from top of spine to bottom of largest rib bone. FPT14752 - 2 each - Long tailbone with 8 white bones (large to small) connected to a metal wire allowing the tail to bend in many positions. The largest bone has a female peg receiver on the front. The smallest end bone is pointed on the end. Measures 4-7/8" long. FPT14753 - 2 each - Long neck or tail extension bone with 7 white bones (large to small) connected to a metal wire allowing the bone to bend in many positions. The largest bone has a female peg receiver on the front, the smallest end bone has a round male peg on the end. Measures 4-1/2" long. FPT14754 - White neck or tail extension bone with 6 bones connected to a white "spine". The largest (front) bone has a female peg receiver on the front, the end of the "spine" has a round male peg on the end. Measures 3-1/2" long. FPT14755 - 2 each - Large white fan-shaped scale with a small clamp on the bottom to connect to #6613 dinosaur bones. The scale has a small "MACAO" imprint on one side, and "©1989 FISHER-PRICE" imprint on the other side. Measures 2-1/2" wide (side of scale to other side), 2-1/16" high (top of scale to bottom clamp). FPT14756 - 2 each - Medium white fan-shaped scale with pointed top, and a small clamp on the bottom to connect to #6613 dinosaur bones. The scale has a small "MACAO" imprint on one side, and "©1989 FISHER-PRICE" imprint on the other side. Measures 2-1/16" wide (side of scale to other side), 1-3/4" high (top of scale to bottom clamp). FPT14757 - 2 each - Medium white fan-shaped scale with a small clamp on the bottom to connect to #6613 dinosaur bones. The scale has a small "MACAO" imprint on one side, and "©1989 FISHER-PRICE" imprint on the other side. Measures 1 1/2" wide (side of scale to other side), 1-3/4" high (top of scale to bottom clamp). FPT14758 - 2 each - Small white fan-shaped scale with a small clamp on the bottom to connect to #6613 dinosaur bones. The scale has a small "MACAO" imprint on one side, and "©1989 FISHER-PRICE" imprint on the other side. Measures 1-3/4" wide (side of scale to other side), 1" high (top of scale to bottom clamp). 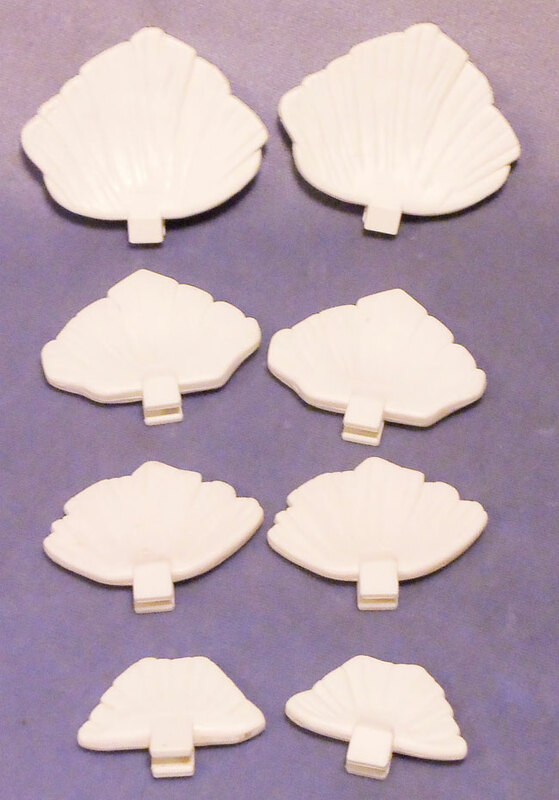 This set was sold in a 21" long, 12" high, 3-1/2" deep box.